Glass is a hard, brittle substance that is usually transparent or translucent. It is made by melting together sand (silicon dioxide), soda (sodium carbonate), limestone (calcium carbonate), and other ingredients. The simplest form of glass (containing only sand, soda, and lime) is known today as plate or window glass. weapons, ornaments, and money from Egypt and Mesopotamia—dating to about 1550 B.C. —still survive. Humans may well have learned about glass-making by witnessing the natural formation of glass by lightning bolts. When lightning strikes areas where sand, soda, and limestone occur naturally, it can fuse these materials to produce a natural form of glass known as obsidian. Ceramic glass Contains titanium oxide; heat and shock resistant; used in range and stove tops, architectural panels, and telescope mirrors. Enamel glass Contains lead and borax; resistant to most chemicals used in bottles, tumblers, glass signs, architectural objects. Fiberglass Formed by forcing melted glass through small openings; used in the manufacture of insulation, fabrics, tire cords, and light transmission (optical fibers). Heat-resistant glass Contains about %5 borax; trade names include Pyrex® and Vicor®; resistant to shock and sudden changes in temperature; used in laboratory glassware and kitchen utensils. Laminated glass Consists of layers of glass and plastic to provide strength and make the final product shatterproof; used in automobile windows. 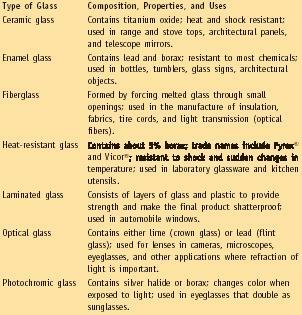 Optical glass Contains either lime (crown glass) or lead (flint glass); used for lenses in cameras, microscopes, eyeglasses, and other applications where refraction of light is important. Photochromic glass Contains silver halide or borax; changes color when exposed to light; used in eyeglasses that double as sunglasses. 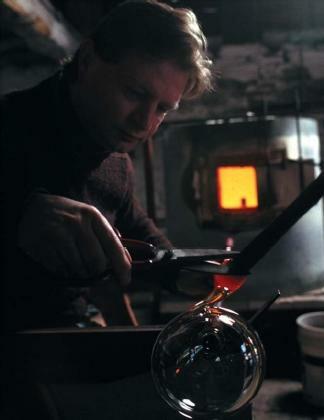 The history of glass-making is a long and fascinating one. Artisans in many parts of the world discovered ways to make colored glass and glass with many special properties. Today, a very large variety of glassy materials exists with many different properties and many applications. Colored glass is made by adding metallic compounds to the basic sand/soda/lime mixture. For instance, red glass is made by adding certain copper oxides or finely divided gold; yellow glass with compounds of uranium and iron; green glass with certain copper oxides or compounds of uranium and iron; blue with copper oxide, cobalt oxide, or finely divided gold; purple with certain manganese oxides and finely divided gold; milky white with calcium fluoride; and opaque with tin oxide. Originally, glass was used primarily for decorative objects such as beads, ornaments, and stained glass windows. Eventually, though, artisans and chemists found that the properties of glass could be changed dramatically by adding various substances to the basic sand/soda/lime mixture. Those properties also could be altered by changing the way glass is cooled, or annealed. For example, plate glass is made first by melting together the basic components—sand, soda, and lime. The liquid mixture is then maintained at its melting point for a long period of time, at least three days. Next, the mixture is allowed to cool down very slowly to room temperature. This process assures that strains within the glass are relieved, making the final product less brittle. Tempered glass is cooled even more slowly, giving it very high strength.